Although I have posted the entire article, be sure to click on the link anyway for an animation of the transit. You'll find a picture of the Sun, and a little black dot representing Mercury will immediately start slowly moving across the picture. 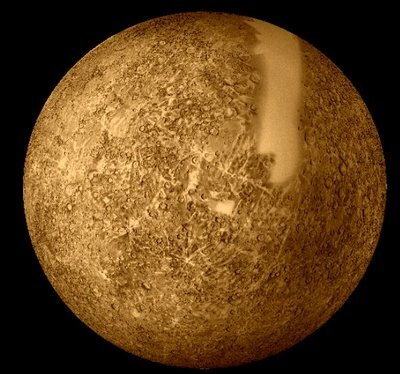 My illustration is a photograph taken of Mercury by Mariner 10 during one of its three flybys in 1974 and 1975. Mark your calendar: On Wednesday, Nov 8th, the planet Mercury will pass directly in front of the Sun. The transit begins at 2:12 pm EST (11:12 am PST) and lasts for almost five hours. Good views can be had from the Americas, Hawaii, Australia and all along the Pacific Rim. During the transit, Mercury's tiny disk—jet black and perfectly round—will glide slowly across the face of the Sun. Only a speck of the Sun's surface is actually covered, so the Sun remains as dangerous as ever to look at. But with a proper filter and a little imagination, the Transit of Mercury can be a marvelous experience. There are many ways to safely observe the Sun, e.g., through eclipse glasses or by means of a pinhole projector. In this case, nothing beats a telescope equipped with a sun-safe H-alpha filter. H-alpha filters are narrowly tuned to the red glow of solar hydrogen. They reveal the Sun as a boiling inferno, cross-crossed by dark magnetic filaments and peppered with sunspots. Warning: The sight of Mercury navigating this starscape could be mind blowing. Here's something to think about while watching the transit: Mercury is fantastically mysterious. More than half of the planet is unknown to us. When Mariner 10 flew by in the mid-70s, it managed to photograph only 45% of Mercury's cratered surface. What lies on the other side? More craters? Or something totally unexpected? You're free to speculate, because the next spacecraft to visit Mercury, NASA's MESSENGER probe, won't enter orbit until 2011. One of Mercury's greatest secrets is the mystery-material at its poles. Radars on Earth have pinged Mercury and received a strong echo from polar craters. A favorite explanation is ice. While Mercury's daylit surface heats up to 400o C, the temperature in deep, dark polar craters dips below -200o C. If an icy comet landed in one of those craters (or made one of those craters), the comet's ices, vaporized by impact, might re-freeze and stick around. As skeptics like to say, however, "it's just a theory," one of many that MESSENGER will check. Another puzzle is Mercury's wrinkles. Geologists call them "lobate scarps." Like wrinkles on a raisin, the scarps are thought to be a sign of shrinkage. Mercury may actually be collapsing in on itself as its massive iron core cools and contracts. To check this idea, MESSENGER will map Mercury's magnetic field, which springs from the core. If the core is collapsing, the collapse may leave telltale signs in the planet's magnetism. MESSENGER will also look for lobate scarps on the uncharted side of Mercury to see if this is truly a global phenomenon. The answers are years away. Meanwhile, we watch and wonder, and Nov. 8th is a good day for that.